Oath of Fealty(2010) by Elizabeth Moon: I've waited an awfully long time for Moon to continue her fantasy series, started with Sheepfarmer's Daughter. Rather than Paks being the lead in this new trilogy, we follow Kieri Phelan in his new life. Great book. Can't wait until the next is out. Moon always has strong, interesting women (as well as male) characters and it's just a relief not to need to always be glossing over the lack of same. An author I generally look forward to reading and I've pre-ordered the next in the series. cross bones (2005) by Kathy Reichs: It's strange that I love the TV series Bones so much and yet had never read a book that it was based on. I'm a late comer to the series (it was in season 5 before I saw my first), so I'm also a late comer to the books. Not the gory series I had thought when I first read about a forensic anthropologist (before I'd heard of the series), this was an interesting dabble into the "Jesus family" controversy that I actually remember reading about almost a decade ago. Nice light read, with lots of interesting detail on the archeology and situation. And Brennan is much less "relationship challenged" in the book than in the series. The Mermaid's Madness (2009) by Jim C. Hines:A grown up take on some of the classic fairy tales. I preferred the 1st to the second, but I will probably still get the third. 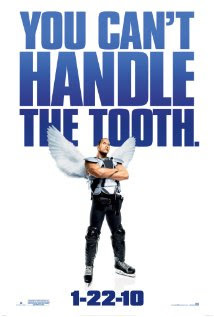 I just watched The Tooth Fairy with Dwayne Johnson and it was absolutely hysterical. With several uncredited riffs by Billy Crystal, whom I adore, as well as Julie Andrews as the Fairy Godmother. Not to be missed and my girls will be able to watch it this week (the German and I were pre-viewing), unlike Percy Jackson and the Lightning Thief (pre-viewed earlier in the week). The former had a great story and one that I want my children to learn: that hard work and practice and good will can help one to succeed. The latter was (beside being far too violent for my girls) all about how one's success is solely determined by who one's father (or, secondarily) parent or relative is. Not the ideology I want my children to take in. One could look at this in the context of the Royal Wedding, or the American ur-story versus the European, but I'll leave it at the simple: one is appropriate for my children at this stage and the other will not be, even with explanation, for many years. systématiquement suspendu dans les 48 heures pour des raisons de sécurité. NB: Tout en nous excusant pour ces désagréments. Service Google Mail Vous remercie pour votre compréhensions. It's been a busy week and it's going into a busy week. The middle of this two week period was T2's birthday party. We had a party for her and her friends (and T1 got to bring a friend along) on the weekend. They seemed to all enjoy themselves. We aren't quite certain why Germans will not RSVP, no matter how one asks, but at this point we are used to calling to confirm attendance (important because we also saw a puppet show Rumpselstiltskin and therefore it was necessary to be timely and for us to have a headcount). I made my standard chocolate cake with the requisite pink frosting and purple and white sparkling sugar. That was followed with Monday's cake for her class and the cake for the last day of my class this semester. I actually ran out of butter for my third cake this week and had to use sprinkled powdered sugar and sparkling sugar for a frosting for T2 and make a French Yogurt Cake (with rose water) for my cake (as it used olive oil rather than butter). I was very glad to reach the end of the baking until next month! The rest of the week will be practice Seders and buttoning up next month's newsletter. I recently took a class at the Volkshochschule called "The Five Elements of Chinese Cooking". This was a mistake on my part, because what I thought I was taking was a Chinese cooking course. Instead, I was taking a cooking course that was based on the Chinese Five Elements of Fire, Water, Iron, Wood and Earth. I enjoyed the course, in its slightly woo-woo, perhaps one also believes in homeopathy way, and I found the food that we actually cooked interesting because it was really German. In fact, I was able to use it as a discussion with my mother-in-law later. Here above, however, you see a quite nice freshly made vegetable soup with Grießmehl Knödel. The recipe appeared very similar to that of matzoh balls, but they were as thick and heavy as cannonballs. I had always heard of matzoh balls tasting like cannonballs, but my mother's recipe (the Manischewitz recipe often made with soda water and then cooked in chicken soup) is light as air. Now I know whereof they speak and now I know whence matzoh balls derive. Truly these things barely increased in size when cooked, while matzoh balls more than double, but all the mass was as a ball of iron. Generally, I don't like people who vandalize my environment. I think taggers are idiots who should be punished for defacing other people's property. This, however, is art. I enjoy walking by it (and not the ancillary vandalism) every day. The question is, however, whether this piece of art being allowed to remain is what drew the vandals to tag around it? It was a busy day today, but let's put that aside. I came home from swimming lessons with T2 at about 18:00, always a difficult time to find parking. We were still in our swim shoes and her hair was sopping wet. There was only 1 open spot close to our apartment, but there was an auto parked across two spots preventing its use. I pulled up next to the spot, because the car was running and there was someone reading, but that person didn't move, although he saw me. So I went down the block, we put our regular shoes on, and I walked back to our building. After crossing the street and passing the running car, I thought. Then, holding my wet 4 year old's hand, I knocked on the window. He looked up, ignored me, looked down. I knocked again. He rolled his window down. I begged his pardon and asked if he knew that he was blocking two spots (and yes, I was speaking German). He responded in his native German, that he was perfectly aware. I pointed out that it was impolite for him to do so (unhöflich) and he agreed and said he didn't care and rolled his window up. As he was doing so, I thanked him for displaying such perfectly German behaviors. That's not what made me laugh. What made me laugh was that after I went home, I was still so annoyed at this flaming a****l**h that I grabbed my NikonD50 and went down to take a picture of his car. If he had asked, my response was going to be that I wanted his picture on my wall, so when I wanted to know what a perfect a****l***h looked like, I could look at him. Or I would look for a website that posted pictures of such, like we have for pervs in NYC. However, for some reason, he was so frightened of my camera that as he saw me approaching he ran away. I'm not certain why, because being an a* is definitely not illegal in Germany (there are many perfectly open and self satisfied such here), but perhaps he felt that parking in a spot marked Artz was (it's not). Here you see him fleeing. I chuckled for the next hour. When I discussed this with the German when he got home from München, he asked me why I felt this was such German behavior, rather than just that of any old a**. Because he stated it right out, I said. In NY, the answer would have been (even if not true): "Oh, sorry, I didn't notice. Have a great day." After he thought for a second, he agreed: it was indeed a particularly German interaction. Here the rudeness is straight out and direct, as a German would say. We haven't taken a real set of family photos since we moved here from the US. 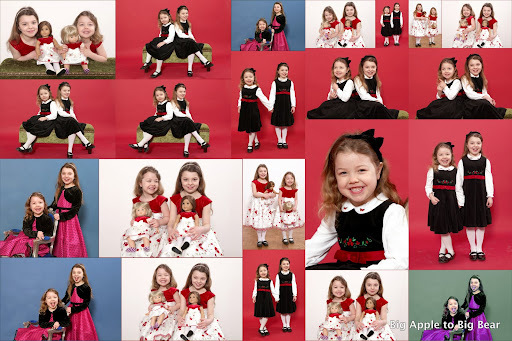 I've really felt the lack, but at least we have had a few school photos for the children. When T2 didn't have a smile in this year's lot, my tremendous dissatisfaction came to a head and I tried like mad to find the equivalent of Sear's Photo Studios: decent to good shots at a decent to good price. I am happy to pay a sitting fee and to commit to purchasing a series of photos, but I want to have the data burned on disc. I don't believe in "binding the mouths of the kine", but to be told that I should expect to pay 14€ and up per print and then, if I wanted the data, 25€ per shot, blew my mind. And that's with an affiliate verein discount! I found a fabulous woman who has a wonderful way with children. She has opened a new studio in Berlin and I can say nothing but wonderful things about her. We paid a fair sum and we are satisfied and we have our data. Her fees are for her skill and her time and those are worth the money we paid. Rosa Reibke's prices for prints are great and to be able to own our data at the end makes us very happy. I hope her new business is extremely successful, because it deserves to be.